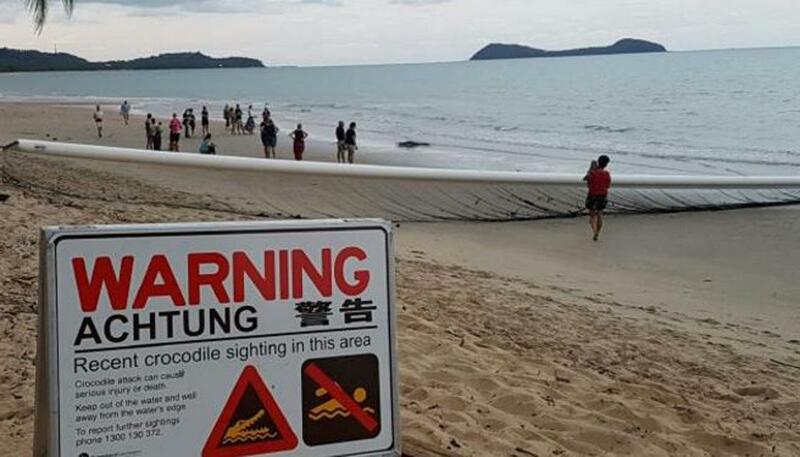 A crocodile has wandered out of the water and right up to unsuspecting beachgoers in Cairns, Australia. About 100 locals and tourists were enjoying the Kewarra Beach view on Friday evening when the croc emerged from the sea and sat itself just metres away. Local Karen Bradtberg told the Cairns Post she was playing cricket with her daughter when she noticed a crowd gathering near what she initially mistook for a large log. "It was just out of the shallows there with its mouth wide open," she said. "It sat there for a good half-hour or so then it turned around and decided to go back out into the water. "It would have been between 1.5m and 2m. I used to love swimming down there, and now it's really put me off." The incident follows a confirmed sighting of the croc earlier in the day at Holloways Beach, which led to its closure for about four hours, according to Surf Life Saving Queensland regional director Rob Davidson. "It appears the crocodile then moved north up the coast and there was an unconfirmed sighting at Trinity Beach at about lunchtime. "[Indigenous Land and Sea Rangers] were out looking for this croc and our lifeguards are being extra vigilant."